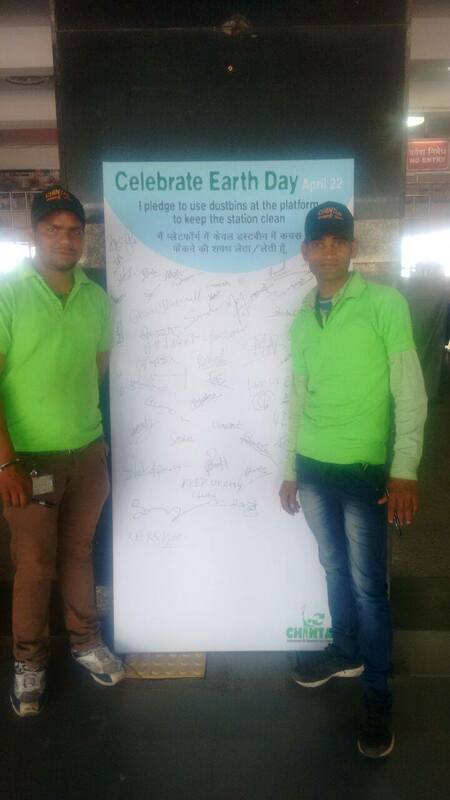 Chintan in partnership with the Indian Railways celebrated Earth Day on April 22nd, 2015 at the New Delhi Railway Station. The Divisional Railway Manager, Northern Railways and his team of officials fully supported Chintan’s initiative and congratulated the team on its excellent work in waste management at the stations. The celebration included two themes. First, visitors on platform 1 from 2 pm to 5 pm were encouraged to sign a pledge to use the bins and stop littering the platform and tracks. Wastepickers from Safai Sena and Chintan team members answered their questions about waste and recycling. In addition, public announcements of the event were regularly made over the public address system at the station. “The Earth day event is part of our ongoing Swachh Bharat initiative which Chintan advocates and supports. 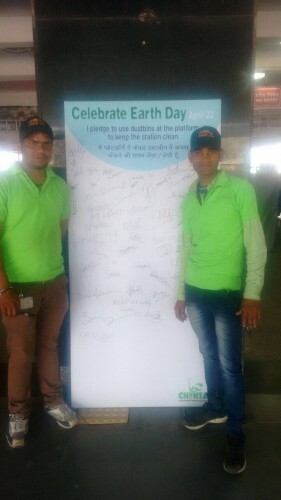 It was a great source of inspiration to every visitor and encouraged them to think of their role in keeping the station clean and thinking about the efforts the Railways have put into recycling. The Public was very enthusiastic and people from all walks of life especially children showed great enthusiasm in signing the Clean the Railways pledges, “said Chitra Mukherjee, Manager, Advocacy and Outreach, Chintan. Over the last 6 years Chintan, an environmental research and action group, has been working in partnership with the Indian Railways to keep the railway stations at New Delhi, Old Delhi, Hazrat Nizamuddin and Anand Vihar, clean and dirt free. Chintan collects waste from all the trains as they arrive on the platform, provides liners for bins on platforms and collects the waste before it spills out. This helps the platform stay clean, despite being crowded. The waste is taken to a Material Recovery Facility (MRF) where it is segregated into various categories. The PET bottles are cut to avoid any refilling and misuse. Finally, the segregated waste is taken to a bigger facility outside the stations, from there it is further segregated by a team and from there, for recycling. Chintan has provided wastepickers with uniforms and I-Cards and created green jobs for them. The wastepickers work seven days a week to make sure the trains are clean and the bins are not over flowing and unsanitary. Reflective of the era of Swachh Bharat, it is a wastepicker’s initiative to clean the New Delhi Railway Station that has won the prestigious Deutsche Bank Urban Age Award, 2014 for this Green project. The Urban Age Award is given to the best urban initiatives in various cities across the world. In the past, projects in Istanbul, Mexico City, Cape Town, Rio de Janerio, Sao Paolo, and Mumbai have been awarded. The Deutsche Bank Urban Age Award is presented to initiatives that utilize partnerships to improve the quality of life and the quality of the urban environment. The work of Chintan at the New Delhi Railway Station shows how not only can urban spaces be sustainable, inclusive and embracing of the poor, but in fact, the poor, such as the wastepickers, are germane to the safeguarding of the commons and making them more usable by all. Chintan said that it was really only on account of the enthusiasm, guidance and the co-creation of the Railway Officials that the project has taken off at all and described it as a “PPP project in the true sense”. Through this unique partnership of Chintan, Indian Railways is able to handle its waste, reduce pollution, create safe livelihood opportunities for the poor and make the railway stations greener. About Chintan: Chintan partners with the informal recycling sector, such as wastepickers and kabaris, to clean up cities, recycle more efficiently and create livelihoods for wastepickers. As a result, it is also able to help children picking trash to go to school, as families earn steadier incomes. About Safai Sena: Safai Sena is a registered group of waste pickers, doorstep waste collectors, itinerant and other small buyers, small waste traders, and other types of recyclers, in operation since 2009. They have been working with Chintan to upgrade the work of adult waste pickers and waste handlers and provide the city with high quality waste management services.